# More information about DIR#3 with Erin Morris and Nathan Bugh here. 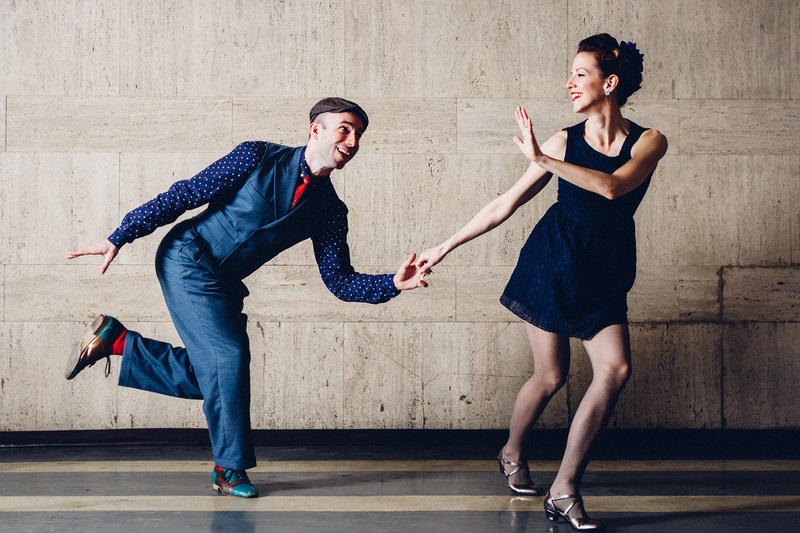 # We have weekly Lindy Hop classes on four different levels and a weekly Solo Jazz class for intermediate/advanced dancers. Please register only for a level whose prerequisites you match. # The maximum of participants per class is 24 people. # Therefore we ask to register only if there is a deep interest in a lived Lindy Hop dancing and an exchange about the dance. # The Early-Bird-Registration starts on Tuesday, 3th of June 2014 at 00:01 AM! I have enthusiastically been dancing Lindy Hop regularly for more than a half year but less than a year and know just about how a swing out works. I know 6-count-basics, 8-count-basics, and charleston basics, and maybe even some fancy variations. I’ve been dancing Lindy Hop for more than a year, both in trainings and social events, feel good about my musicality in dance, I freely combine and vary the moves I’ve learned. I dance a lot and have already been to a couple of international workshops, I can dance to fast tempos (185 bpm+) and sometimes invent my own variations while dancing. # If there are enough registrations, this class will be devided into two levels and the second class (higher level elected by an audition) will start at 20:30 also on Thursdays. I know the Shim Sham and some Solo-Jazz and -Charleston moves or even some other jazz routines (eg: Tranky Doo, Jitterbug Stroll, Big Apple, Al &Leon Shim Sham, St. Louis Shim Sham). And I feel comfortable with learning steps and routines on a regular tempo. People attend classes/workshops and the DIR-programm entirely at their own risk. Participants of classes/workshops and the DIR-programm are temporary “supporting members” of the association IG HOP. In case you have to cancel your registration, we will have to charge 50% of the full price in the time of cancellation betwenn six to two weeks before classes start. Within two weeks before the classes start, we charge 75% of the full price and after classes started we don’t refund at all.